Few Chinese have heard of Transsion Holdings, a Shenzhen-based company, which has grabbed more than 40 percent market share in Sub-Saharan African countries. In 2016, it outperformed its main competitors like Samsung in terms of feature phone shipments in the African market. Transsion's success there might inspire more domestic competitors to follow suit. But experts also warn that such mobile phone makers need to prepare to face certain challenges when doing business in Africa, such as widespread political instability and low consumption. Transsion Holdings, a Chinese mobile phone maker based in Shenzhen, has grabbed more than 40 percent market share in Sub-Saharan African countries. In the first quarter of 2017, the company ranked first place among Chinese mobile phone exporters, shipping 27.4 million units, according to Beijing-based data provider AVC. Huawei, the world's third largest phone maker by shipments, ranked second place. In 2016, Transsion outperformed its main competitors such as Samsung in terms of feature phone shipments in the African market, according to a report by market research company IDC in March. However, few Chinese have heard of the company as its mobile phones are not sold domestically. About 10 years ago, due to rising domestic competition, "a good number of Chinese mobile phone makers started to explore foreign markets, but many have failed as they didn't focus on branding and wanted quick returns," Wang Yanhui, secretary-general of the Mobile China Alliance, told the Global Times on Wednesday. International mobile phone makers are reluctant to enter the African market due to the low consumption there, Li Yi, chief research fellow at the Internet Research Center under the Shanghai Academy of Social Sciences, told the Global Times on Wednesday. Li noted that it could be an opportunity for domestic mobile phone makers. But Li also warned that the path to exploring the African market will not be easy due to the uncertain risks there. Transsion is one of the domestic mobile phone makers seeking opportunities in Africa. They narrowed their focus to the market in 2008. Wang attributed Transsion's success in Africa mainly to the company's founder Zhu Zhaojiang, who is very experienced in overseas markets. Additionally, the company operates locally in African countries to secure its dominance there, said Wang. At the beginning, the company set up a marketing strategy to "become a leader" of emerging economies, Arif Chowdhury, vice president of Transsion, told the Global Times. The continent has huge potential with a population of more than 1 billion, he noted. Transsion was right about the market. Africa's population of mobile users accounted for 12 percent of the total individual subscribers in the world and amounted to 6 percent of global revenue, an increase of 70 percent compared to figures from five years ago, according to a CNN report in November 2016. In total, 215.3 million mobile phones were shipped to Africa in 2016, up 10 percent year-on-year, according to data released by IDC in March. 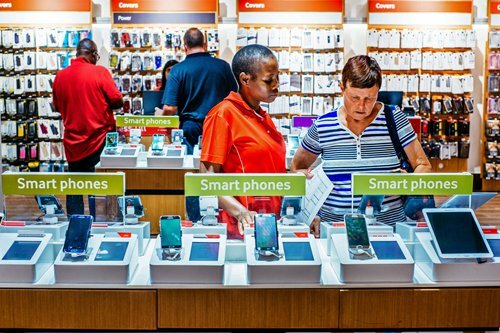 Chinese-made mobile phones indeed have the positive reputation of good functions and low prices and are strongly welcomed by most African consumers. "Chinese mobile phone makers can produce what you want and are flexible in designing products to meet customers' needs," Rayan Abdelrahman Ahmed Mohamed, a 33-year-old Sudanese, told the Global Times. Africans love music, loud speakers and two SIM cards, which Chinese mobile phones can provide, he said. Many larger companies intend to sell the phone's brand instead of the quality of the product, he said. "Why [should] I pay for the brand? I pay for my need." There are many telecom operators in Africa, and it's not cheap to dial between networks, so we produce phones with dual, and sometimes even four, SIM card slots, said Chowdhury. African customers, like many other smartphone customers around the world, love taking 'selfies'. But the customers with darker skin say it is hard for them to take good quality photos as many smartphone cameras have poor facial recognition. Transsion, on the other hand, designs specialized cameras that focus on people's teeth and eyes to ensure photographic clarity. "We have different brand tactics to provide high, medium and low-end products for our diverse consumers," Chowdhury noted. Recently, the interest in the African market from Chinese mobile phone makers has been increasing; they have been expanding their businesses to more and more countries, but this new venture has invited mixed results from across the continent, according to IDC. Of the big Chinese mobile phone makers, Huawei saw year-on-year shipment growth to "remain as Africa's No.3 smartphone vendor in 2016, while Lenovo saw flat growth and ZTE and Alcatel both [witnessed trimmed sales]," said IDC. Huawei and Lenovo didn't respond to the request to give comment on their performance in the African market. "Price competitiveness has become a key issue in many African markets," said an IDC report released in March citing Ramazan Yavuz, research manager for mobile devices in Africa at IDC. Both Wang and Li said that vendors have to provide phones which are priced very competitively to aid to the large amount of low-income populations in the continent. Meanwhile, mobile phone makers face the fact that the cost of phone components is rising. They need to produce good quality products but with affordable prices, as well as to keep companies profitable. Before raising the value of their phones, Chowdhury said the company will monitor the prices of the components provided by different suppliers by buying a large amount of them at reasonable prices. "In the short run, Transsion has had less pressure from other competitors in the African market," said Wang, the secretary-general, noting that Africa is a big market, with more than 50 countries, and therefore huge potential. Most companies will face challenges due to differences in culture, language and regulations when operating overseas, said Wang. Echoing Wang's statement, Chowdhury said that they have spent $75 million to establish after-sales networks in African countries during the recent few years. Transsion also has sales networks in 58 countries, including Nigeria, Kenya, Tanzania, Ethiopia and Egypt. Moreover, companies need to understand the development and political situation in some African countries, said Li, the aforementioned chief research fellow, noting that it will take at least another 15 years for the market to mature in Africa. Even for Transsion, it has taken almost a decade for the company to gradually build its brand in order to meet local customers' needs.